Here's the last post in my series of AOP terminology posts. This week's term is "weaving". Weaving is a general term to describe how an AOP tool combines an aspect with the rest of your code. Castle DynamicProxy uses runtime weaving. You can think of it as just like using the decorator pattern, except instead of coding each decorator by hand, Castle DynamicProxy will create those classes for you at runtime, by combining the IInterceptor implementation (that you've created) with the object that you want to intercept. PostSharp is a post-compiler tool. It will take the aspect class that you've defined and actually modify your compiled program to weave it in to the methods/properties/etc you want it to intercept. I think a good way to visualize this is by using a decompiler to see what the code looks like before and after PostSharp has modified it. Here's a very basic console app with a single aspect applied to a single method. Don't panic, it's not as complicated as it looks: don't let the weird naming throw you off. Notice line 23: that's the only line that I wrote inside of the DoStuff method. The rest all comes from the aspect. The try/catch/finally structure was all put in to place by PostSharp. The first line of the method now calls the OnEntry method that I defined in the aspect. The OnSuccess method is the last thing called inside the Try. The OnException is called inside of the Catch. And OnExit is called inside of the Finally. (Note: they all get null arguments because I don't actually do anything of value inside the aspect, otherwise you'd also see some code to create the argument objects to pass in). You can see that even though your source code is separated out into two classes, PostSharp does the work of weaving the cross-cutting concerns into the other method. "Aspect" seems like the core term in "aspect oriented programming" doesn't it? An aspect is simply a way to indicate to an AOP tool: what and where. The "what" is the advice, and the "where" are join points. i.e. 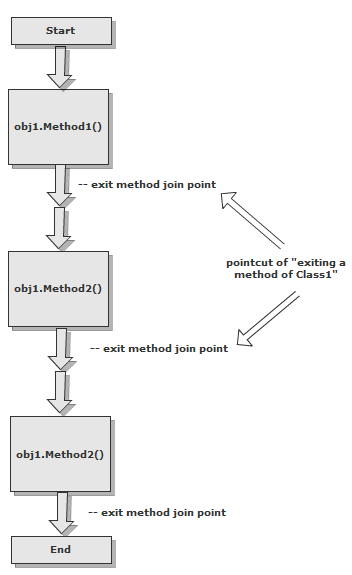 the complete pointcut is "before the MyMethod method of MyClass is executed"
Looks like two more terminology posts to go. If there's a term that I'm missing or glossing over, let me know, and I'll write a post on it. I'm trying to cut through some of the confusion around AOP by providing simple definitions and examples of often obtuse terminology (see also: other terminology posts). A pointcut is a simply a set (or an expression that returns a set) of join points. If a join point is a single line between two boxes on a flowchart, then a pointcut would be a description of a set of those lines. For instance, if you wanted to put some logging after every time a method in a given class was called, you'd first get a pointcut of all the join points that occur after each method. If there are 5 methods in your class, you have 5 join points that make up the specified pointcut. So if your aspect defines "OnExit", and you apply that aspect to a class "CustomerRepository", then your pointcut is "whenever a method in CustomerRepository exits". You could narrow that to a single method, or expand it to an entire namespace.